Pride magazine The Pride magazine has been in the market for more than two decades now. This magazine contains news mostly related to the Afro-Caribbean women residing the United Kingdom region. The Pride magazine has been in the market for more than two decades now. This magazine contains news mostly related to the Afro-Caribbean women residing the United Kingdom region. Being among the largest and the most successful women magazine it has also bagged many awards for itself. This monthly magazine is so popular that it has a circulation of more than 30,000 copies of magazine in the United Kingdom itself and a lot more online sale. The Pride magazine is highly respected in the world of advertisements since only the best of companies get to reach out to the market through this magazine. Some of the companies related to this magazine include Vodafone and Ford. This lifestyle magazine had recently upgraded its format and attracts more and more readers for itself with each passing day. Its readers will be delighted to know that this magazine has been dominating the market for more than 15 years. The glossy paged magazine is known to cover a lot of information related to the glamour world and lot of hot gossip. This amazing magazine also contains information regarding the latest trends that are followed. It also discusses fashion and beauty tips, that one can easy follow and practice at home, themselves. It is a youthful and fun magazine to read. 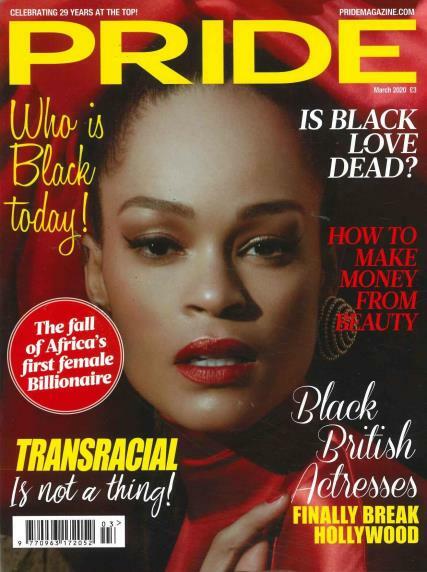 The Pride magazine is also a very inspiring magazine especially for the women’s of the Afro Caribbean community. The trend setting magazine though has its readers from all over the world and its readers are mostly young women. The Pride magazine is an extremely reader friendly magazine as it is written in crisp and easy intelligible language. The Pride magazine has crisp and lucid language making it a very reader friendly magazine. Apart from being the best lifestyle magazine it is a very enriched and informative magazine for its readers. So hurry and go grab a copy of United Kingdom’s most famous lifestyle magazine for yourself.